Nica Rojo is the voice behind some of your favorite anime characters. When you turn on the radio and hear an ad, it might not cross your mind but you're listening to the work of a voice actor. Similarly, if you catch your K-dramas on local TV, that's also a voice actor playing Lee Sung-kyung or Kim Soo-hyun. Enter Nica Rojo, a 31-year-old voice actress who entered the industry in 2007. Though she might be best known for her role as Edward Elric of Full Metal Alchemist: Brotherhood, she also fills other roles like automated dialogue replacement (ADR) script-writing and directing. What's something that people don't know about voice acting? Voice acting is acting. People usually ask me what it takes to be a voice actor; and I always say, "Make sure you can actually act." What led you to voice acting? Bata pa ako, mahilig na akong manood ng TV—from sitcoms to documentaries to animations. I joined a dubbing contest in an anime convention—just to de-stress from my [interior design] college thesis—and voice acting felt natural to me. I was very excited to perform. We didn't have a script, so I had fun thinking of my ad-libs. It was an anime convention so I understood the humor of the crowd. What was it like being a newbie in the industry? The industry is very diverse. I really enjoyed the company of veteran voice actors when I was starting. They shared some really meaningful advice on acting and voice characterization. Now that I have younger coworkers, I try my best to do the same for them. Wala naman kasing maitutulong ang bullying sa work. How do you usually get your projects? Most of the roles I got were because of auditions. I had to prove myself. I was lucky enough that when I started in the business, the networks were starting to hold auditions for the shows. So, kahit newbie lang ako, I had the chance to fight for a character. The clients didn't know who the actors were kaya hindi sila biased. Never naging factor kung newbie or veteran ka na. I studied formal Japanese and watched a lot of movies to become more familiar with other languages, para kapag kailangan sa work, I'd know what to do. I don't ditch my recordings and considering the horrendous traffic, I do my ~very best~ to be on time. And when it comes to script submissions, I'm never late. It depends on the number of recording sessions I have each day. We usually record three to five episodes for 20-minute shows and two to four episodes for 45- to 60-minute shows, depende sa requirement ng studio. Sometimes, it just takes 30 minutes to an hour if I only have a few lines, but it could take the whole day if I have to do block dubbing. That's when you record with other voice actors. I wake up at 5 a.m., I swim, bike, or run before going to work. Normally, recording starts at 10 a.m. If I'm really busy, sometimes I don’t go home until the next day! But I don't do that anymore, because I've learned the importance of work-life balance. No matter how much you love your work, you'll get burned out. What is your monthly income range now? How often do you have to work? I usually work four to seven days a week. On average, I get at least P40,000 a month. If dubbing is scarce, I write ADR scripts for some directors. 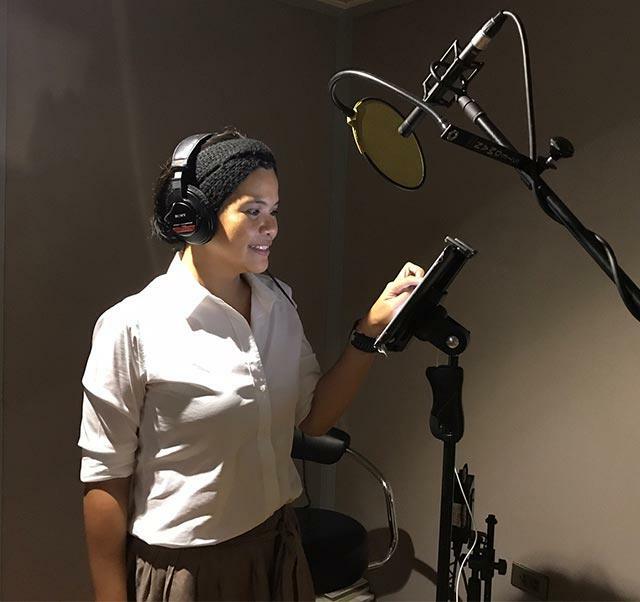 A voice actor can get as low as P2,000 or some as much as P10,000 to P15,000 ~a day~. It really depends. What is standard industry price? The floor price now is P600 per episode of a 30-minute animation. A 45- to 60-minute live action series starts at P900. I wish people would take time to do other activities and not just work, work, work. Doon kasi lumalabas 'yung konsepto na raket lang ang voice acting. Some just say yes to all the recordings that come their way without really thinking kung kaya pa nila or maibibigay pa ba nila 'yung 100 percent nila for that project. I understand na it's important to make money, pero maraming hindi matatapatan ng pera like health and improvement of well-being. I believe that if you have other things na gustong gawin besides work, you should pursue it no matter how old you are. What advice would you give someone interested in the biz? Study! Always show up to auditions—and show up prepared. No matter how young you are in the business, if you don't show up, mas lalong wala kang chance to be part of the cast. And of course, this is like any other business din. It's not all fun and games, rainbows and unicorns. Don't be discouraged kung hindi ka makuha agad. Take time to invest sa mga makakatulong sa 'yo.